T-Mobile announces roll over data stash | Android Blast! Competition is fantastic isn't it? T-Mobile continues its "uncarrier" moves as it announces a data roller program. In 2015, T-Mobile will start offering to save user's unused data in a data stash for up to a year. The roll over data stash can get as big as you want and T-Mobile will even start your stash with 10 GB of data. The data stash is available to customers who have a postpaid Simple Choice plan, and have purchase 'additional 4G LTE data." Another thing to keep in mind is if you're taking advantage of T-Mobile's LTE network, your data will go fast. BELLEVUE, Wash., Dec 16, 2014 (BUSINESS WIRE) -- T-Mobile (NYSE: TMUS) today announced its next industry-rocking Un-carrier� move -- eliminating the infuriating wireless industry practice of confiscating unused data you�ve already paid for. With Un-carrier 8.0, high-speed data you don�t use each month automatically rolls into a personal Data Stash� so you can use it when you need it for up to a year. And, the best part is that Data Stash is included at no extra charge for every single new and existing T-Mobile customer � individual, family or business � on an eligible postpaid Simple Choice plan who buys extra high-speed data for their smartphone or tablet. In addition, T-Mobile announced they will start every Data Stash with a whopping 10 GB of 4G LTE data � for free. That�s 10 GB of free data for every line in the family on a qualifying plan. And on top of that, the Un-carrier announced several major new milestones in the build-out of its Data Strong� network. �Can you imagine your gas station siphoning unused gas from your car each month? 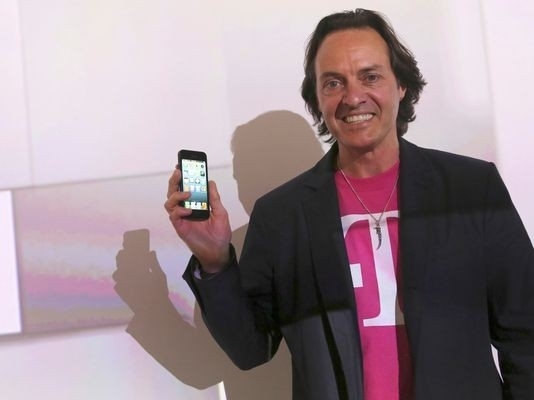 The US wireless industry is even worse,� said John Legere, president and CEO for T-Mobile. �Americans have been gamed by the carriers into buying huge data plans � all to avoid getting screwed with overage penalties. Only to find out they bought more than they need which is then confiscated by the carrier. For the consumer it�s lose, lose. With T-Mobile�s Data Stash -- the first such program from a national wireless provider -- you don�t have to worry about buying extra high-speed data you�ll never use -- or not having that data when you need it most. You�ve paid for it. Now you can use it when you need it for up to a full year. Starting in January 2015, Data Stash will be automatically available at no extra charge to every T-Mobile customer � every individual, family and business � with a postpaid Simple Choice plan who has purchased additional 4G LTE data, 3GB or more for smartphones and 1 GB or more for tablets. And, you�ll start out with a Free Data Stash with up to 10 GB of 4G LTE data. Once you�ve used up that Free Data Stash, any unused high speed data -- rounded up to the nearest megabyte � will start to roll into your Data Stash automatically every month. And there�s no limit to how much data you can collect in your Data Stash. When you need extra high-speed data, you�ll automatically start tapping into your data deposits. Now, when you pay extra for 4G LTE data, you won�t lose data you don�t use. Businesses face the same challenges when it comes to the data guessing game � just multiplied by the number of employees they have. Think it�s hard choosing how much data to buy for you and your family? Try figuring out how much to buy for you and your 50 employees. More than a third of U.S. businesses on shared data plans have been hit by punitive overage penalties, and others resort to buying more data than they need � all just to avoid budget-busting overage penalties at the end of the month. First, T-Mobile continues to grow its LTE footprint and now reaches more people than ever before -- 260 million Americans coast to coast, expanding to reach an additional 10 million people in just the last 60 days. Second, on the heels of upgrading T-Mobile�s network to its ultra-fast Wideband LTE in New York, the Un-carrier now reaches 121 metropolitan areas across the country with Wideband LTE, giving customers more capacity and up to a 50 percent boost in speeds. Already, T-Mobile customers in the NYC metro area have reported download speeds in excess of an unprecedented 100 Mbps. Finally, T-Mobile announced that it has deployed its newly acquired 700Mhz spectrum in Cleveland, Colorado Springs, Minneapolis and Washington, D.C. boosting network reach, improving in-building coverage and extending coverage well beyond major population centers. The Un-carrier expects to continue its rapid fire network improvements in 2015 and has already set a few resolutions for the New Year -- like reaching 300 million people with T-Mobile�s blazing-fast LTE network. For more information on T-Mobile�s network advancements this year, please read this blog by T-Mobile CTO Neville Ray. For more information on T-Mobile�s Data Strong network, please visit www.t-mobile.com/DataStrong. For more information about T-Mobile�s Data Stash and other ground-breaking Un-carrier benefits, please visit www.t-mobile.com/DataStash. Qual�g postpaid service req�d. On-network data from past 12 mos carries to next bill cycle. 200MB Free Data for Life & roaming allotments do not carry over. Not avail. with Match Your Data offer or discounts. Data does not begin carrying over until after free 10GB runs out. Free 10GB available until 12/31/15. As America's Un-carrier, T-Mobile US, Inc. TMUS, -0.79% is redefining the way consumers and businesses buy wireless services through leading product and service innovation. The Company's advanced nationwide 4G LTE network delivers outstanding wireless experiences to approximately 53 million customers who are unwilling to compromise on quality and value. Based in Bellevue, Washington, T-Mobile US provides services through its subsidiaries and operates its flagship brands, T-Mobile and MetroPCS. For more information, please visit http://www.t-mobile.com.